Louis Jacob after Watteau, L’Abreuvoir, engraving, c. 1730. This painting and its pendant, Le Marais, were engraved in reverse by Louis Jacob at an undetermined date around 1730 for the Jullienne Oeuvre gravé. 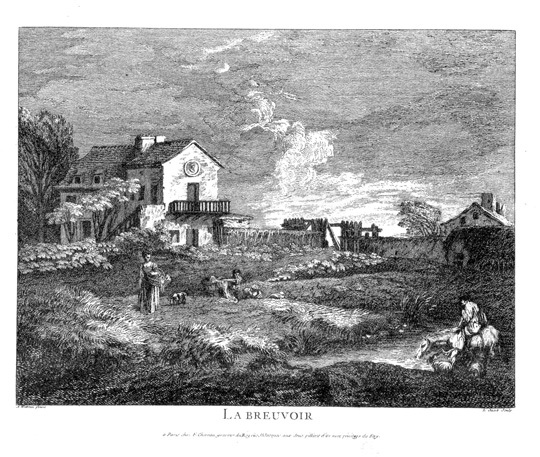 It appeared with the title La Breuvoir. The owner of the painting is not indicated on Jacob’s engraving, and no trace of the picture has been found in eighteenth-century sale catalogues. Mariette, "Notes manuscrites," 9: fol. 126, no. 26. Hédouin, “Watteau” (1845), cat. 36. Hédouin, Mosaïque (1856), cat. 36. Goncourt, Catalogue raisonné (1875), cat. 195. Dacier, Vuaflart, and Hérold, Jean de Jullienne et les graveurs (1921-29), 1: 46; 3: cat. 137. Réau, “Watteau” (1928), cat. 198. Adhémar, Watteau (1950), 84, cat. 107. Mathey, Watteau, peintures réapparues (1959), 67. Parker and Mathey, Watteau, son oeuvre dessiné (1957), cat. 444. Eidelberg, Watteau’s Drawings (1965), 71-73. Eisler, “Two Immortalized Landscapes” (1965-66), 165-76. Eidelberg, “Watteau’s Use of Landscape Drawings” (1967), 175. Macchia and Montagni, L’opera completa di Watteau (1968), cat. 84. Cormack, Drawings of Watteau (1970), 27. Ferré, Watteau (1972), 3: cat. B99. Roland Michel, Watteau (1981), cat. 110. Posner, Watteau (1984), 109, 283 nn. 68-69. Roland Michel, Watteau (1984), 159-60. Washington, Paris, Berlin, Watteau 1684-1721 (1984), 99-102. Grasselli, Drawings of Watteau (1987), 232-34. Rosenberg and Prat, Watteau, catalogue raisonné des dessins (1996), 1: cat. 235, 3: cat. R575. 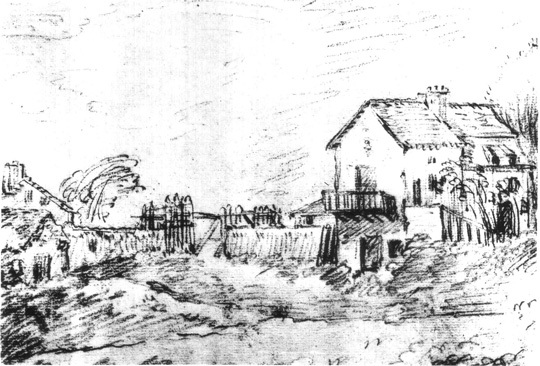 Watteau, A Farm in the Porcherons, red chalk, 8.5 x 14.3 cm. New York, Metropolitan Museum of Art. A remarkably small Watteau drawing discovered by Colin Eisler in the collection of the Metropolitan Museum of Art (Rosenberg and Prat 235), apparently made on site in the countryside, served as the basis for L’Abreuvoir. The painting includes an additional building and clump of trees at the far left, but as the sheet is cut at the left side, it is possible that they were there originally in the drawing as well. Although the drawn landscape is unpopulated, Watteau added staffage figures to the foreground of the painting. Jean-Baptiste Pater, Landscape after Watteau, red chalk, 15.4 x 21 cm. Paris, private collection. Before Eisler’s discovery of the drawing in the Metropolitan Museum, it had been presumed that a drawing formerly in the so-called Groult Album was Watteau’s study from nature for the painting (Rosenberg and Prat cat. R575). The attribution to Watteau was accepted by Parker and Mathey, and by Eidelberg. Subsequently, it was realized by Grasselli and then by Rosenberg and Prat that the drawing was by Pater, as are many of the studies in the Groult Album. 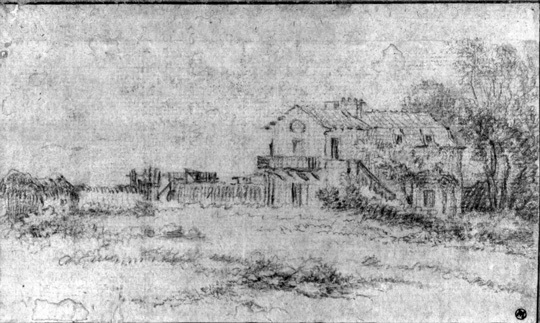 Pater’s drawing includes the buildings and trees seen at the left side of Watteau’s painting, but, as has already been noted, these elements might have once been in Watteau’s drawing. Thus a question arises as to what Pater’s source was. Was he copying the painting or the drawing? Aspects of Pater’s graphism suggest he may have been copying the drawing. Also Pater did not include the staffage figures or the pond and other features seen in the foreground of the painting. Grasselli’s idea that Watteau and Pater were studying the same site side by side seems less likely. This landscape and its pendant, Le Marais, as well as Watteau’s Veüe de Vincennes, are examples of the artist’s early landscape paintings. They are quite remarkable—not only because of their agrarian subjects but also because they follow a distinctly Northern landscape tradition. They suggest the humble origins of Watteau’s art, unlike many of his later landscapes with their Venetian lyricism. Mariette wrote that L'Abreuvoir and Le Marais were “veües, qui ont été peintes par Wateau d’après nature, dans le temps qu’il demeuroit au fauxbourg des Porcherons.” Dacier, Vuaflart, and Hérold interpreted Mariette’s remark to signify that Watteau painted the two landscapes when he was living with Crozat on the rue Richelieu in 1712. However, there is no firm evidence that these paintings can be pinpointed to 1712 (and not, say, to a year earlier or a year later). Nonetheless, Adhémar, Roland Michel, and Montagni followed suit in retaining 1712 as the operative date for the painting. Grasselli, as well as Rosenberg and Prat, proposed that the Metropolitan Museum drawing (and thus the painting) was executed c. 1714. Posner posited a date after 1712, but no later than 1715 for the painting. Only Mathey has proposed a date as early as 1709. Ferré, consistently erratic and generally misguided about Watteau’s oeuvre, cast doubt on the authenticity of L’Abreuvoir. He quotes his colleague Saint-Paulien (a pseudonym assumed by Maurice-Yvan Sicard) as saying that Jacob may have engraved a bad copy, but he doesn’t explain what this copy was after. The theory does not bear scrutiny.